The author of50 Jobs Worse Than Yoursis back with fifty relatives so bad they might make you actually look forward to your next Thanksgiving. They're kooky, they're crazy50 Relatives Worse Than Yoursis a nightmarish family reunion that will have you appreciating your own weird clan. There's theFamily Newsletter Publisherwho keeps you updated on how Uncle Carl's hip is doing; there'sHolistic New Age Aunt, who knows Madonna from Kabbalah class but refuses to introduce you because that would be bad karma; and there'sChild Who Was in a National TV Commercial, who has more money than you do. And then there'sUncle Speedo, theMonopoly Bank Thief, andYour Son, the Tenant. 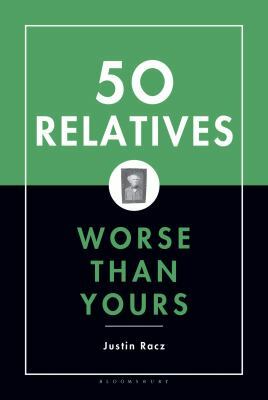 Filled with hilarious photographs and bullet points listing all their horrible characteristics,50 Relatives Worse Than Yoursis the perfect gift for anyone who's embarrassed by some members of their family, which let's just admit it is about everyone. And who knows, you might even recognize a relative or two...Racz, Justin is the author of 'Fifty Relatives Worse Than Yours ', published 2005 under ISBN 9781596910553 and ISBN 1596910550.